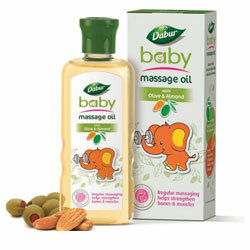 Dabur Baby Massage Oil With Olive & Almond - Paraffins Free, Natural Oils, No Artificial Colours, Dermatologically Tested for skin safety. Dabur - Health Care Product - Worldwide Shipping. Regular massaging helps to strengthen bones and muscles. Dabur Baby massage oil with Olive and Almond is enriched with the natural goodness of olives and almond, keeping in mind the importance of these two ingredients for the baby's development. It helps provide nourishment to babies soft skin. Gently moisturizes delicate skin making it soft and supple. Regular massaging helps to strengthen bones and muscles.